Drum Circle fitted in well with the creativity being exhibited at the Mind, Body and Soul Exhibition at Leeson House, Swanage, over 4 days supporting the work of the Alzheimer’ Society. To that end the exhibition featured the work of distinguished local artists Andrew Thomas; sculptor and Phil Hill, painter focusing on the relationship between art and well being, and promoting therapeutic benefits of creative practice in all forms. 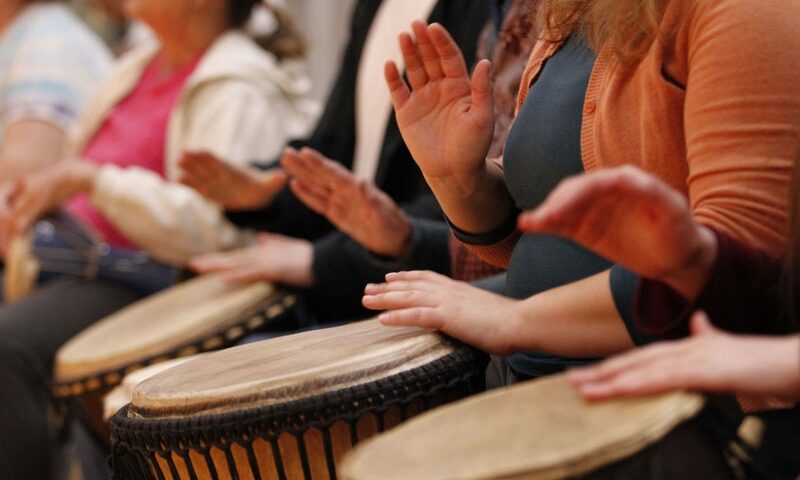 Christine Thomas commented: ‘The drum is an amazing tool for health. It insists that the participant is involved and it offers immediate feedback… which helps to build confidence and self-esteem’. As well as proven holistic health benefits, drum circles offer a real opportunity to add your own unique intuitive creative contribution to a musical percussion ensemble.